DUBAI: People in Saudi Arabia and the wider Gulf region are known for their love of evening socializing and late-night drives. What is less well-known is the high price being paid for this nocturnal lifestyle. 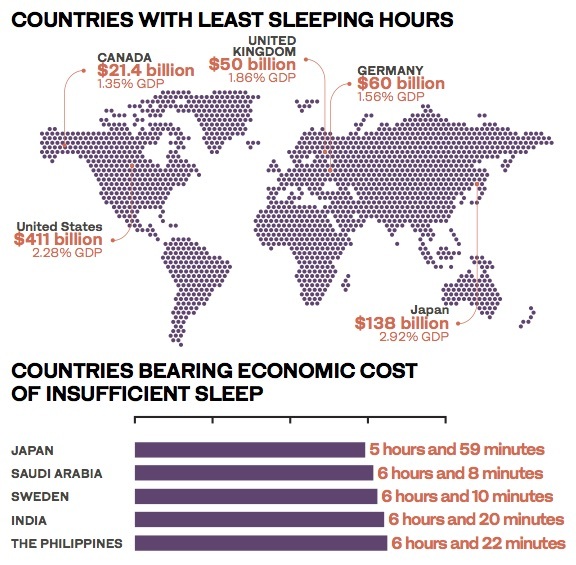 A 2015 report from the app Sleep Cycle placed Saudi Arabia second - after Japan - in the list of the world’s five worst countries for average sleeping hours. Insufficient sleep has been linked to the development of several chronic diseases and conditions including hypertension, diabetes, depression, obesity, depression and cancer. Even so, the demands of modern society keep shortening the time available for rest. More than 1 billion people globally are believed to suffer from sleeping disorders for different reasons. According to the Sleep Cycle report no country achieved an average of eight hours sleep on a regular basis even though the recommended range of sleep for an adult is seven to nine hours a night. The findings of a 2006 case study involving Saudi primary school students, from Dr. Ahmed BaHammam, Dr. Eiad Al-Faris and others at the Sleep Disorders Center at King Saud Medical University, were revealing. The sample comprised 511 boys and 501 girls aged between 5 and 13. Results showed that daytime fatigue, at 37.5 percent, was the most prevalent sleep problem, followed by bedtime resistance at 26.2 percent and co-sleeping with parents at 12.4 percent. Dr. Irshaad Ebrahim, medical director of The London Sleep Centre in Dubai, said mental disorders, including anxiety and depression, physical illness, lifestyle and age were major causes of sleep deprivation. “Among them stress and lifestyle - particularly excessive use of smart devices - or long and odd working hours are something that disturbs sleep most these days,” he told Arab News. He added that an average person spent about one-third, or approximately 27 years, of his or her lifetime sleeping, which is surprising given that the science of sleeping has only recently started getting attention. A 2016 study from King Fahd Medical City revealed that 41 percent of Saudis suffered from some kind of sleep disorder. Ahmad Al-Badr, director of the sleep center, said the rate of sleep disorders in the Kingdom was the same as in neighboring countries. The study, involving participants with the average age of 34, concluded that 55 percent of those affected were women, who are typically bigger victims of sleep deprivation compared to men. But it appeared that the marital status and education level of participants had little to no effect on sleep deprivation. The study revealed that more than half of the participants slept less than six hours every day, mostly late at night. It also revealed that people without jobs suffered from insufficient sleep more than working people. Diseases such as high blood pressure, heart disease and diabetes have adverse effects on sleep. According to the US Centers for Disease Control and Prevention (CDC), the major disorders that cause sleep-related difficulties are insomnia, narcolepsy, Restless Legs Syndrome (RLS) and sleep apnea. Al-Badr said patients with sleep deprivation and sleep disorders needed medical help, for which more awareness and counseling was necessary. “It also needs more training for workers in the health sector,” he told Arab News at the time of the study’s publication. There is a shortage of sleep medicine specialists in the Kingdom and in the Gulf Cooperation Council, said Ebrahim. “The number of trained and qualified sleep medicine specialists in the Kingdom is reportedly 19 physicians located in a few hospitals in three major cities. This number is extremely low.” It is less than 5 percent per capita compared to the US. Dr. Sunil Vyas, a specialist at Aster Medical Hospital in Dubai, said lack of sleep should not be ignored as an urban lifestyle phenomenon. Every second patient he sees suffers from sleep deprivation, he said. “There are authentic reports that more than 50 percent of the UAE population suffers from at least one or more sleeping disorders, which is on a par with the global average in developing countries. This needs immediate attention,” he told Arab News. In 2017 Dr. Siraj Omar Wali told Arab News that insomnia clinics were needed in Saudi Arabia to help tackle the negative impact of sleep disorders. Wali, a director of King Abdulaziz University Hospital’s (KAU) Sleep Medicine and Research Center, urged the establishment of treatment centers in the Kingdom. Wali, who had been speaking at a course and workshop dedicated to sleeping disorders, said that a KAU study found that one in every 10 men and one in every 15 women suffered with obstructive sleep apnea, which relates to breathing problems during sleep. But lack of sleep is not just a health issue. The cumulative effects of sleep deprivation affect a country's economy. According to a 2016 report from the not-for-profit research institute Rand Europe, sleep deprivation was directly related to lower productivity, which resulted in a significant number of working days being lost every year. In Democracy and Dictatorship in Europe, Sheri Berman traces the long history of democracy in its cradle, Europe. In her study of European political development over more than 200 years, Berman, a professor of political science at Barnard, shows that the story of democracy in Europe is complicated. “The ultimate goal, she believes, is liberal democracy, with elections, respect for the rule of law, individual liberties and minority rights. But that is a rare, and hard-won, achievement. A step forward is often followed by a step back,” said Max Strasser in a review published in The New York Times. “This may seem a bit obvious to anyone familiar with the broad outlines of European history, but Berman makes the case clearly and convincingly. Moreover, at a moment when hyperventilating over the decline of democracy has grown into a veritable intellectual industry, her long-view approach comes across as appealingly sober,” Strasser added.